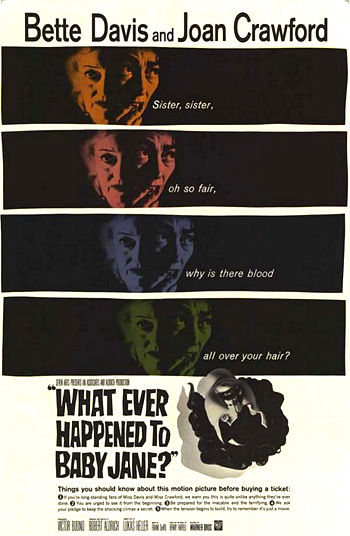 A great psychological thriller, black comedy, and over-the-top camp classic is this great trashy melodrama - What Ever Happened to Baby Jane? (1962). It features the bizarre (and sole) pairing of two legendary -- and rival -- screen legends in a gothic, macabre, Grand Guignol horror film, directed by Robert Aldrich (known earlier for the great nihilistic film noir Kiss Me Deadly (1955)). If you're long-standing fans of Miss Davis and Miss Crawford, we warn you this is quite unlike anything they've ever done. You are urged to see it from the beginning. Be prepared for the macabre and the terrifying. We ask your pledge to keep the shocking climax a secret. When the tension begins to build, remember it's just a movie. The film received five Academy Award nominations including Best Actress (Bette Davis), Best Supporting Actor (Victor Buono), Best B/W Cinematography, and Best Sound, with one win for Best B/W Costume Design. A follow-up film, Hush... Hush, Sweet Charlotte (1965), also directed by Aldrich, placed Olivia de Havilland in Crawford's co-starring role as Miriam (Davis' cousin) opposite Bette as a haunted, desperate, and demented recluse spinster named Charlotte Hollis. A 1991 TV-remake starred Lynn Redgrave in the malevolent title role, with her real-life sister Vanessa as Blanche. Pasty white-faced Jane, whose career faded long ago, is now a deranged alcoholic, and vengefully bitter and jealous toward her wheelchair-bound sister secluded in an upstairs bedroom. Enmity worsens when a local TV network airs a marathon tribute to Blanche Hudson movies, and Jane learns that Blanche is planning to sell the mansion and put her in a sanitarium. - Jane serves an ex-pet and a roasted rat to Blanche for "din-din." Blanche: "You wouldn't be able to do these awful things to me if I wasn't in this chair." Jane: "But ya AAH Blanche, ya AAH in that chair!" - Jane garishly dressed up as a little girl as she is being coached by impoverished pianist and musical director Edwin Flagg (Victor Buono in his film debut) for an improbable comeback. She croaks, "I've Written a Letter to Daddy." The film's ending echoes the beginning when Jane purchases two strawberry ice cream cones and then insanely spins, pirouettes and dances - drawing a curious circle of people around her to fulfill her craving desires. "Won't you show us where she is, please?" "Won't you take us to her? Please, Ms. Hudson."